In November 2014, Pier A opened to the public for the first time in its 128-year history, following an extensive restoration led by the Battery Park City Authority. In partnership with the City of New York, the Authority funded the renovation of the Pier’s structure, which was critical to the preservation of this important landmark. Listed on the National Register of Historic Places, Pier A stands today as Manhattan’s oldest remaining pier. Built as the headquarters for the New York City Docks Department in 1886, Pier A was subsequently used by a variety of municipal agencies over the years, including the city’s police and fire departments. The Pier’s clock tower, affixed in 1919, was installed as the country’s first formal commemoration of World War I in the United States. As part of its renovation, the Battery Park City Authority went to great lengths to ensure many historic elements of the structure were kept intact, including preservation of the building’s exterior. Numerous protective measures have also been taken, to provide as much resistance as possible to any future storms. Completed in accordance with the Battery Park City Authority’s guidelines for environmentally responsible development, Pier A has earned a LEED Gold certification from the U.S. Green Building Council. Today, the building is home to Pier A Harbor House, a fine dining establishment managed by Pier A Battery Park Associates LLC, a joint venture between the Poulakakos family and the Dermot Company. The first floor of the building, known as the Long Hall, is open to the public and includes a visitor center managed by the Downtown Alliance. Here passersby have an opportunity to learn about the region’s rich history, while enjoying the breathtaking views of New York Harbor from the promenade. The Community Center at Stuyvesant High School is the result of a unique partnership created by the City of New York, Stuyvesant High School and the Battery Park City Authority. The Community Center offers recreation, classes and events for people of all ages and interests. The Community Center is open to the public evenings and weekends when school is not in session. Because the Center is shared by students, faculty and community members; certain safety regulations must be followed. Join us in making the Center a vital downtown resource. Battery Park City Parks Conservancy manages the Community Center at Stuyvesant High School. BPCA's recreational, sports and arts programming in the parks, gardens and playing fields of Battery Park City has provided positive experiences for people of all ages and diverse interests. BPCA is similarly committed to making the Community Center at Stuyvesant High School a vital place for good health, life-long learning and pleasure. The Community Center offers expanded membership categories as well as additional fitness and recreational activities (led by sports, fitness and dance specialists) and seminars on subjects related to happy and healthy living. You can participate either through membership or on a class by class basis. BPCA is very interested in your ideas for new and improved Community Center programs. The Battery Park City Ball Fields provide ample space for community sports such as softball, kickball, Ultimate Frisbee, lacrosse, football, and soccer. Although the majority of time is set aside for youth play, adults are also welcome, particularly in the summer months. The latest artificial turf, installed by the Battery Park City Authority in 2013, uses an elastomer, virgin rubber product as fill, which offers a more resilient play surface compared to the standard recycled rubber crumbs used on many other turf fields. This durability optimizes the field’s use by the community, as there is considerably less “down time” required for maintenance. The synthetic grass of the turf is made of recyclable polyethylene material. The two baseball fields are adjacent to each other with moveable netting available to separate them during games or to create additional practice spaces when needed. Permits are required for public use. For more information on the Ball Fields hours of operation and permit applications, click here. Poets House is a national 60,000-volume poetry library, creative workspace, and literary center that invites poets and the public to step into the living tradition of poetry. Poets House — through its poetry resources, literary events for adults and children, and archival and poetry-related visual art exhibitions — documents the wealth and diversity of modern poetry and stimulates public dialogue on issues related to poetry in culture. Founded in 1985 by two-time Poet Laureate Stanley Kunitz and legendary arts administrator Elizabeth Kray, the library has created a home for all who read and write poetry. In 2009, Poets House moved into its permanent home, at 10 River Terrace in Battery Park City, on the banks of the Hudson River. For more information about these events and Poets House in general, visit the site and join on Facebook and Twitter. The Battery Park City Branch is New York Public Library's first green LEED certified branch in Manhattan. The bright 10,000 square-foot, two-story branch houses a collection of over 23,000 items, separate reading areas for children, young adults, and adults, a multipurpose programming space, and offers access to 36 public computers and a wide range of services for the community. 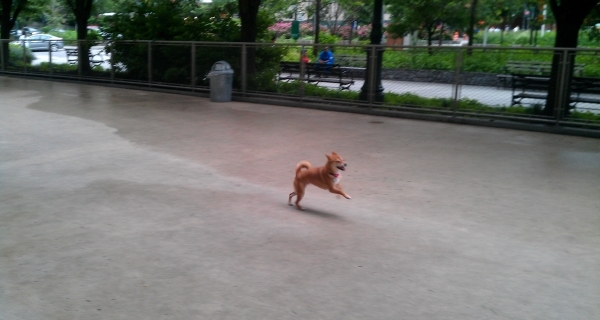 This run is an entire block in length and includes separate spaces for both large and small dogs. 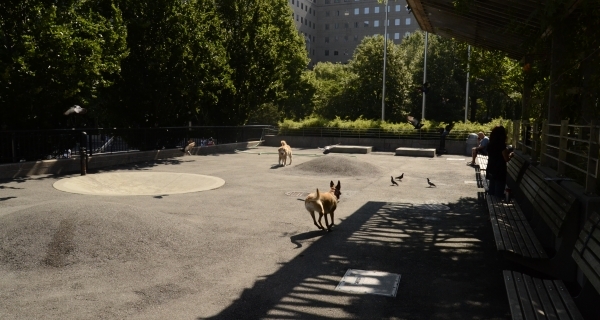 The Sirius Dog Run at Kowsky Plaza was created to accommodate the large numbers of dogs who live in the Gateway Plaza complex. Others are welcome, of course. While small it is extremely popular. 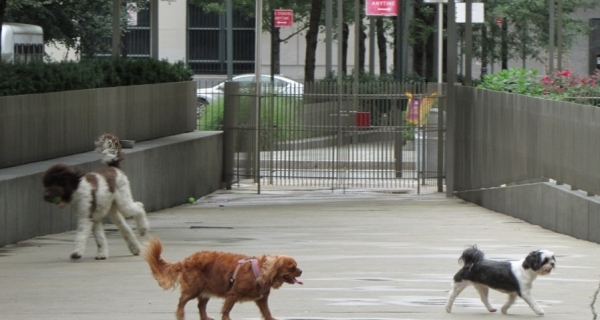 The West Thames Street (located just South of West Thames at Little West Street) includes separate spaces for large and small dogs as well as benches, shade structures and trees on both sides.